The M14 Scout is a sporting model affording exceptional performance, suitable to those pilots that usually fly alone but do not want to give up the possibility to share fun with a companion too. -115HP turbocharged Rotax 914, that makes the M14 exuberant and capable of great ascents, take-offs and landings in narrow spaces. In single-seat flights additional comfort is given through a backrest joined to the seat that can be removed in case of two-seat flight. Thus the passenger sits just behind the pilot, near enough to communicate with each other. The side “cheek” extensions besides giving the cockpit an aggressive look, shelter the passenger’s feet and legs from the wind. With its 50 liters fuel tank capacity, the M14 Scout has a maximum range of about 3 hours. Like all Magni’s two-seat gyroplanes, the M14 Scout is equipped with digital Flydat instrument for monitoring all engine parameters and features all the basic flight instruments. Furthermore, for making piloting easier, the M-14 Scout is equipped with electric trim. The M14 Scout is really agile and enjoyable, it affords a sport yet reliable flight, without giving up to the comfort which pilots need in case of longer flights. Chrome-alloy aeronautical 4130 steel, TIG welded Empennage, wheel fairing and main undercarriage made of composite materials. Manufactured in epoxy resin reinforced with fiberglass. Arplast 3-blade propeller, carbon fiber with ground adjustable pitch. 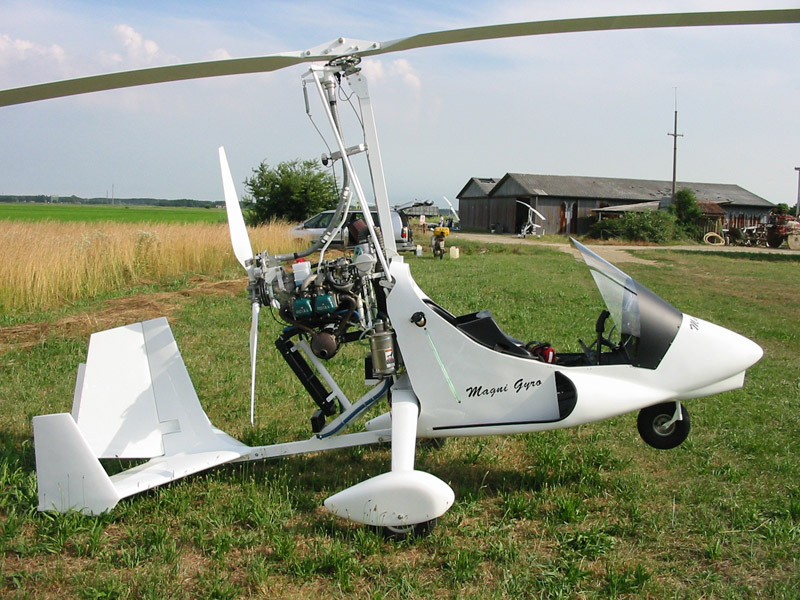 2-blade, composite materials, manufactured by Magni Gyro.